The International Workshops on Weak Interactions and Neutrinos have been organized regularly for the past 40 years at many venues in Africa, Asia, Europe, Latin America, and the United States. The 26th edition (WIN2017) will take place at the University of California in Irvine, from June 19 – 24, 2017. 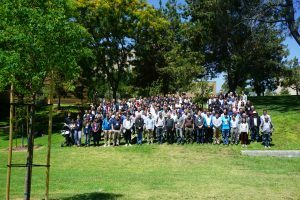 The goal of these Workshops is to offer the physics community a significant opportunity to assess the status of major topics within the field and initiate collaborative effort to address current challenges. The Workshops attract leading experimentalists and theorists, from all over the world, allowing them to exchange ideas and to develop new strategies. In many cases the efforts initiated at these Workshops result in completed projects that are published in international journals. These projects have sometimes proven to be major breakthroughs such as the MSW effect, which was first discussed at the WIN85 meeting in Finland.